When Ibn Sina (980 – 1037 CE) was about ten years old, a group of missionaries belonging to an Islamic sect came to Bukhara from Egypt and he writes that it is from them that he learned Indian arithmetic. This, George Gheverghese Joseph, writes in The Crest of the Peacock: Non-European Roots of Mathematics shows that Indian math was being used from the borders of central Asia to North Africa and Egypt. Though there is a such a rich history, we rarely learn about the greatness of Indian mathematicians in schools. Even our intellectuals are careful to glorify the West and ignore the great traditions of India. A prime example of that was an article by P. Govindapillai, the Communist Party ideologue, in which he lamented that the world did not know about the contributions of the Arab scientist al-Hassan. In response, I wrote an Op-Ed in Mail Today in 2009. Thus it is indeed great to see that NPTEL ran a course on Mathematics in India – From Vedic Period to Modern Times. The entire series of around 40 lectures is available online. It is there on YouTube as well. It starts with Mathematics in ancient India with the Śulbasūtras and goes past the period of Ramanujam. It goes through various regional scientists including the members of the Kerala School of Astronomy and covers the difference between the Greco-Roman system of proofs and how Indian mathematicians did it. Kudos to Prof. M. D. Srinivas, Prof. M. S. Sriram and Prof.K. Ramasubramanian for making this available to the general public. The 19th century was also a period of racial science and it was encouraged by Orientalists in Madras who discovered that South Indian languages were not derived from Sanskrit. Following this discovery, Vedic texts were interpreted to read that white-skinned Aryans subdued dark-skinned and snub-nosed dasas. The similarity of Indo-European languages along with such heroic conquests led the search for the mysterious homeland from where these aristocrats set forth. With this the British could explain their presence in India as yet another wave of Aryan invasion, similar to the many waves that happened before. Once scholars started searching for the homeland, it turned out that you could throw a dart at a world map and there was a theory of origin from that place. As of 2013, there are three homeland theories that are prominent. The first one — the Anatolian-Neolithic — proposes that Indo-European originated in Anatolia and spread through Europe along with the spread of farming. The spread of the language towards India was explained using two models. The first one proposed that the language spread eastward from Anatolia to India and the second one suggested that it was a later southward migration from Central Asia that bought the language to India. After going back and forth between these two models, the present version argues that Indo-European spread symmetrically westward to Europe and eastward to India. The second theory suggests that the homeland was not in Anatolia, but to the south of the Caucasus. The spread of the language did not happen with the spread of farming, but at a much later date. This theory also posits a secondary homeland located north of the Black and Caspian seas. The third one suggests that the homeland was located between the Volga and Dnieper (The Pontic-Caspian) during 4500–3000 BCE. In a 2013 paper titled Twenty-first century clouds over Indo-European homelands, J P Mallory used the common notion that Anatolian was one of the first languages to split away in the proto-Indo-European framework to evaluate the three homeland theories. In the Pontic-Caspian model, the ancestors of Anatolians leave the region north of the Black Sea and move to Anatolia. Indo-European develops later in the Pontic-Caspian region and the speakers disperse both east and west in the Bronze age. The Near Eastern model presents crazy travel plans. First the Anatolians move out of Anatolia into the Balkans and Indo-European develops in that space. Before the Anatolians move back to their homeland, the Indo-Europeans move out requiring carefully choreographed movements of peoples. In the Anatolian Neolithic model, the Anatolians do not travel back and forth to the Balkans, but stay put. Instead the Indo-Europeans disperse around the world. To paraphrase an Indo-European scholar, the right question to ask these days is not where the Indo-European homeland is, but rather, where do they put it now? Since Indian history has been deeply tied to the movement of Indo-European people, it is important to understand the debate that is going on. If one has to be cynical of the whole enterprise, it has to come from an understanding of the complexity and not through a simplistic denial of the theory. In her book History of Ancient and Early Medeival India: From the Stone Age to the 12th Century Upinder Singh wrote that most historians have abandoned the idea of an Aryan invasion for a ‘several waves of migration’ theory. Though no one knows where they came from or which path they followed, Indian history is still firmly rooted in these external origins. The problems with two centuries of linguistics do not end with diverse homelands or inconclusive paths of migration. There are fundamental issues on what languages belong to the Indo-European tree. Where does Graeco-Armenian or Italo-Celtic belong? Is Tokharian an orphan or should it be associated with the German branch? A debate which is going on this year is if Basque, the ancestral language spoken by people living in the region spanning northeastern Spain and southwestern France, is an Indo-European language or not. These doubts, (See An earlier date for Indo-Europeans in Northwest India) which exist in Indo-European linguistics, is absent in Indian history narratives. There is not an iota of scepticism and a simplistic model still seems to be the norm. In A Survey of Kerala History, Sreedhara Menon summarizes the impact of Tipu Sultan’s brutal raids on Kerala and concludes that it introduced modern and progressive ideas to Kerala. These progressive ideas include collecting taxes directly from the peasants and building roads which connected various remote parts of Kerala. Menon also credits Tipu Sultan for creating a social revolution in Kerala by attacking Brahmins, Kshatriyas and Nairs. By declaring Nairs as the lowest caste and by forcefully converting them into Islam gave the lower castes a sense of prestige and position. As to the drawbacks to Tipu’s wars in Kerala, Menon writes that the wars halted black pepper cultivation and thus destroyed the economy. The ports became empty and unused and the foreign currency that came from trade relations which spanned a millennia came to a halt pushing people into poverty. Fortunately Menon does not call him a freedom fighter, but many many historians and politicians and literary types like Girish Karnad and Bhagwan Gidwani consider him so. They also consider him to be a great warrior, a humanist, the son of Kannada and a tolerant ruler. Sandeep, by going through copious amounts of primary sources on Tipu finds that a fictional narrative has been constructed regarding every aspect of Tipu’s life and the tale which was spread by bards who relied on bakshish, now is spread by modern bards for various nefarious reasons. Another account of Tipu’s march through Calicut records that both men, women and children were hanged; churches and temples were desecrated; women were forced to marry Muslim men. Proud of his accomplishments in Calicut, he wrote a letter gloating about this massive conversion. He also congratulated his commanding officer for circumcising the captives and converting the others. As he marched to Travancore, burning towns and villages, he was halted by the Nairs and extreme cruelty by Tipu caused an exodus of people from Malabar. This is the level of progressiveness that is attributed to Tipu by a writer who had a good idea of what really happened as he was the former editor of the Gazetteer of Kerala. The trend seems to be to not let facts get in the way of a progressive interpretation. Another myth that prevails is that Tipu was a freedom fighter because he fought against the British. Less mentioned is the fact that he working on replacing one colonial power for the other for his own personal gain. In various letters written to the French,he conveyed the notion that he was friends with the local Muslim rulers and with the combined French army, they could rout the British. To entice the French, he promised half the territory that would be taken away from the British and he had correspondence with Napoleon himself. Napoleon was not the only foreigner with whom he bargained. He wrote letters to the Caliph, to Zaman Shah of Afghanistan, and to other foreign Muslim rulers, inviting them to wage the battle against the infidels. Besides revealing such less mentioned facts, the book begins with the crux of the problem which is the problem with historiography in India. These narratives are not written with a focus on revealing the truth, but for subverting certain truths. There is a revealing conversation between S L Bhyrappa and G. Parthasarathy, a Nehru-Gandhi family acolyte, who lead a committee to foster national integration through education. Parthasarathy tells Bhyrappa, who at that time was a philosophy lecturer, that teaching about the iconoclasm of Aurangzeb and Mahmud of Ghazni would poison the minds of the students, offend the minorities and “cleave the society”. Hence it was important to use “maturity and discrimination” in selecting the narrative. In 2009, I wrote a piece for Pragati about these biases and one of the solutions was for us not to leave the history to historians. Sandeep’s book is a good step in that direction. Did Nehru promote a dynasty? This myth draws support from the fact that Nehru’s daughter and grandson also served as Prime Minister, that his grand daughter-in-law has sought that post too, and, most recently, that her son, Nehru’s great-grandson, has joined politics as the heir-apparent of the Congress party. In truth, Nehru had nothing to do with the “dynasty”. 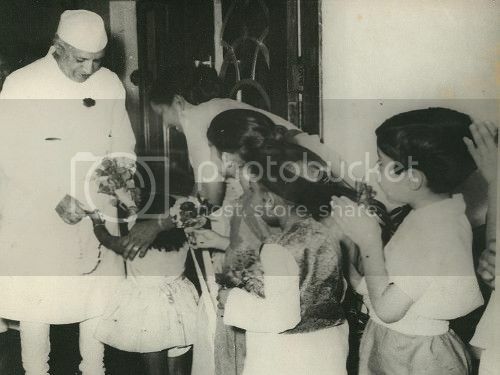 He had no idea, nor desire, that his daughter would become Prime Minister of India. It was Mrs. Indira Gandhi who converted the Indian National Congress into a family business. She first brought in her son Sanjay and, after his death, his brother Rajiv. In their book Six Thousand Days, Amiya Rao and B.G. Rao refute this fairy tale. As Nehru became the supreme leader of the country and the party becoming a rubber stamp to his whimsical ideas, there were questions as to who his successor would be. The clues lay in Nehru’s actions. Nehru’s colleagues have acknowledged another thing as well. If he wanted to get something done and was uncomfortable doing it, he would get others to do it. The Congressmen were only too willing to oblige. Six months after she was nominated to the Working Committee, Nehru resigned from the powerful Central Parliamentary Board and Dhebar on cue, nominated Indira Gandhi. This was the committee which picked the candidates for elections and decided on the political fate of thousands of Congressmen and women. In 1959, while the father was Prime Minister, the daughter became the president of the party. Nehru expressed “surprise” and spun it as the desire for a section of Congressmen to see young leadership. Following this Indira was everywhere: on the executive board of UNESCO, traveling East Africa on Nehru’s behalf, as special messenger to President Johnson, as chairman of National Integration Committee and even on the National Defence Committee, which did not have place for Gen. Cariappa. It was obvious that the daughter was being groomed to occupy the Prime Minister’s chair. A 1961 report from Palam airport observed Cabinet ministers, fixers, chelas and about two hundred odd people walking behind her as she skipped the customs shed and walked directly to the aircraft. According to the Raos, Nehru had molded the party to accept Indira Gandhi as the Prime Minister. He skillfully removed all the strong contenders to the post like Jagjivan Ram and Morarji Desai by making statements that Congress does not encourage people getting addicted to power. He kept people like Gulzarilal Nanda, who would not be a strong contender, but would be a stop gap arrangement. All of Nehru’s actions indicated that he was promoting the dynasty, but it is strange that modern historians have no recollection of all these events. Adapted from Rao, Amiya Rao, B. G. Six thousand days : Jawaharlal Nehru, Prime Minister, Sterling Publishers, 1974.